Rachel Weisz portrays a woman with so many names that even she might lose track of them sooner or later. Today she is a magician. Tomorrow she is a surgeon. The day after she is a biologist. But in reality, Alice is a person who can’t let go of the past. After travelling back and forth from one side of the world to another, she lands in America to say hello to a man, who more or less is responsible for the choices she has to make. It’s Tom’s (Michael Shannon) birthday, when his friend and colleague Clyde (Michael Chernus) brings a newly met woman, Alice at Tom’s birthday party. Certainly, the viewer will be able to tell right away that this woman has a hidden agenda, but it will take a bit of time to figure out. But when after telling her stories at the party how she lived in Tasmania, and then in Asia, Tom after a while recognizes in her a woman he used to be in love with. What was the reason of their separation won’t be explained fully, but it will appear that the young woman this time is willing to clarify her expectations from life by encountering an endless conversation with Tom, who will finally be able to bring Alice to a certain state of mind she expected for such a long time. However, the feeling of the journey she had all these years worth of one-day event or not is something only you, as the audience, by watching Tom and Alice will be able to tell. Joshua Marston has directed a few notable titles such as Maria Full of Grace and famous TV series, The Good Wife and An American Crime. However, with Complete Unknown it looked that he was not sure in which direction to take the actors. 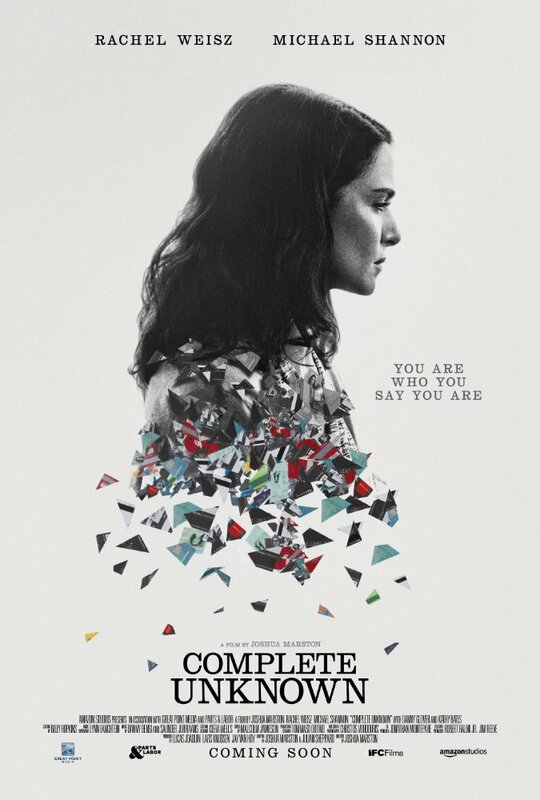 Having Michael Shannon, Rachel Weisz and Kathy Bates in one film is a dream for any filmmaker, but, I am afraid the outcome of Complete Unknown can hardly be considered as a dreamy one. Despite a unique storyline that will be accepted and understood by only a small number of viewers, Joshua Marston as a director could not find depth in the story, which I am afraid, even you will notice. It’s not like it is an unwatchable film, it was just the directorial approach that will take this film to an unknown direction, which none of us would like to locate it afterwards. For that, the actors or the plot cannot be blamed, but Joshua Marston who needed to take Alice’s life seriously to help Rachel Weisz to immortalize her. Because she, like no one else, knows how to revive even an absolutely “dead” and “soulless” character.